Made by ?? 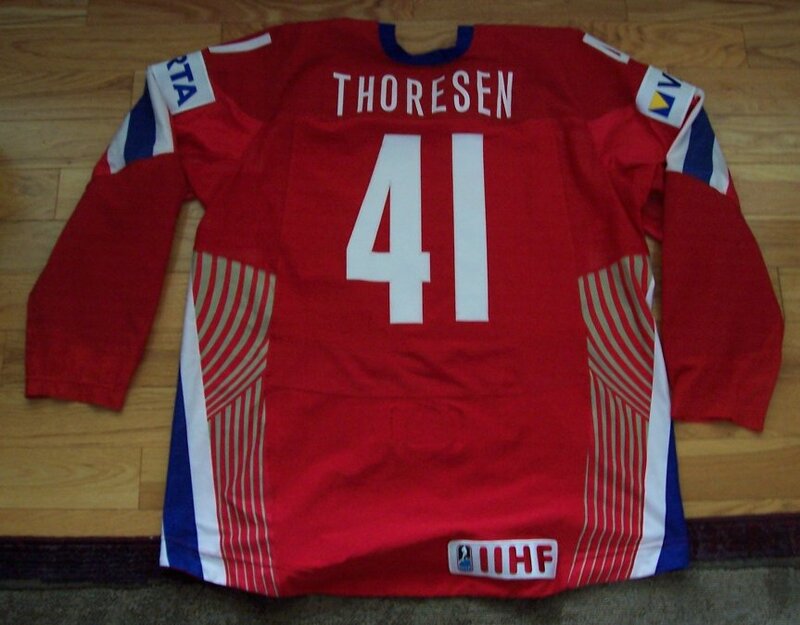 ?, size 50-52, This is a game-worn jersey of the Norwegian National Team. It's time to do some major research in this one to find the year...it's an oldie! I can't thank enough Chriss and Jon for this WONDERFUL shirt! MANGE TAKK CHRIS & JON!!! 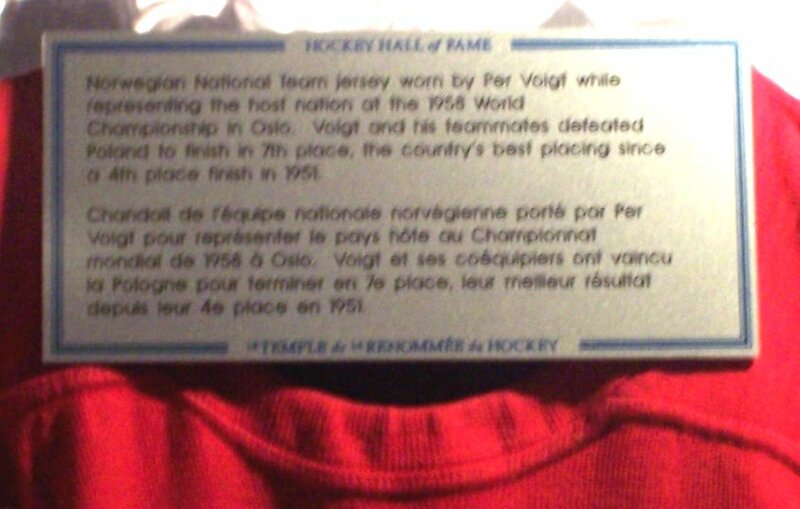 2005-11-11 UPDATE: A visit at the Hockey Hall of Fame in Toronto was extremely exciting for me! 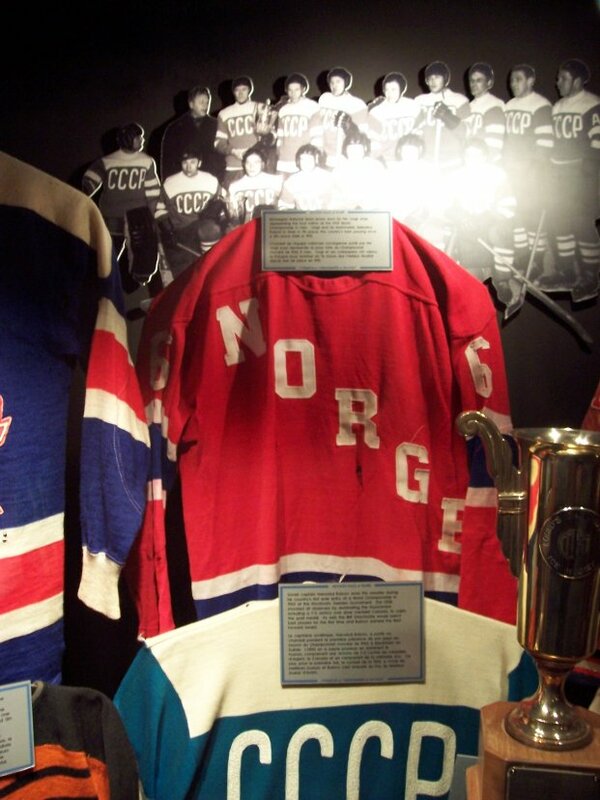 They have on display a 1958 Norway game worn jersey that I was able to match with mine! That's what you call a PLEASANT SURPRISE! THANKS JON AND CHRIS! Made by ?? 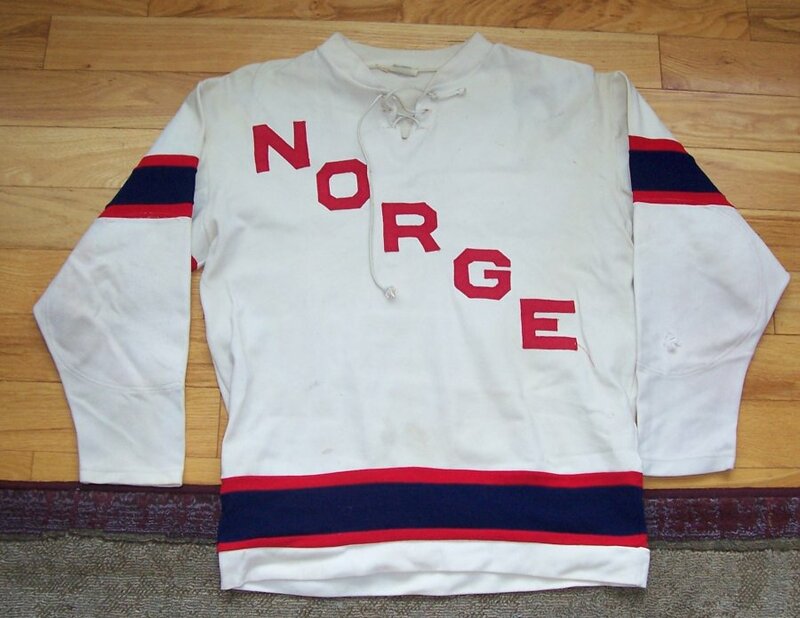 ?, size ?, This is a game-worn jersey of the Norwegian National Team. 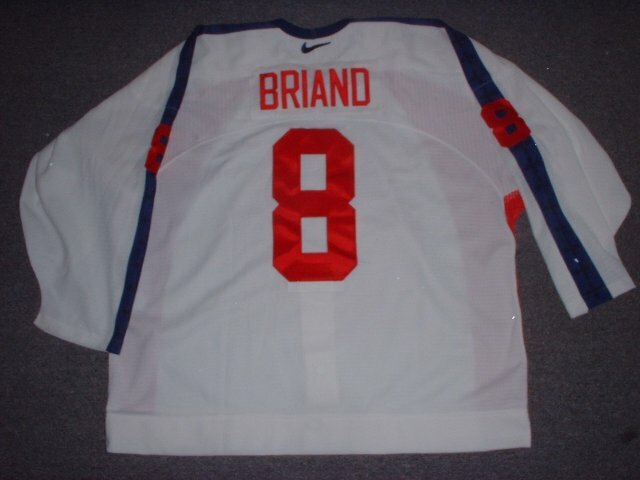 Letters and numbers are heat sealed on the jersey. 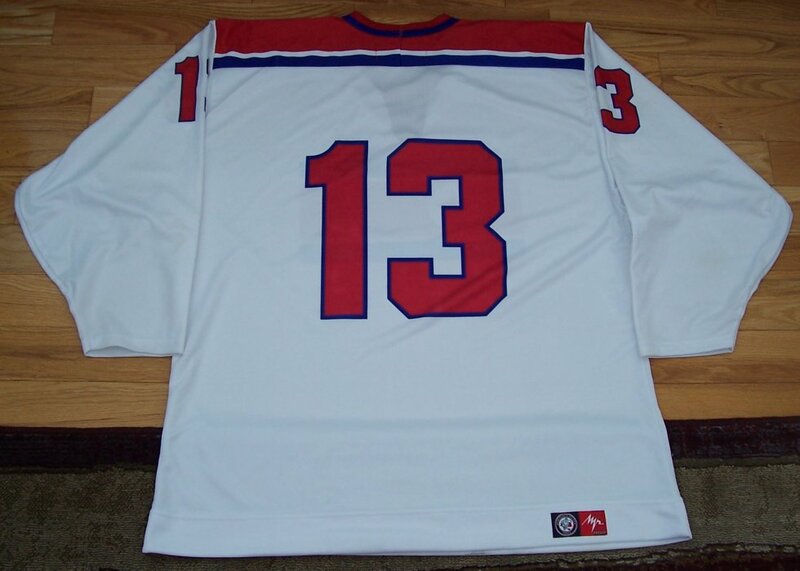 I think it dates from the 1980 Olympics in Lake Placid. as well as the 1979 WC-B tournament. 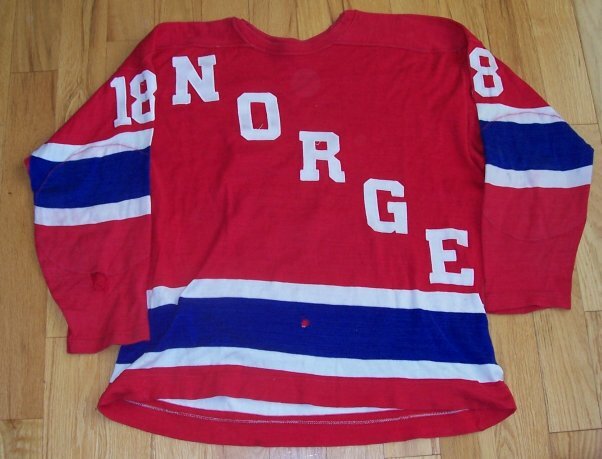 I'm looking for some pictures of the Norwegian team at the 1980 Olympics...if you have some, please LMK! 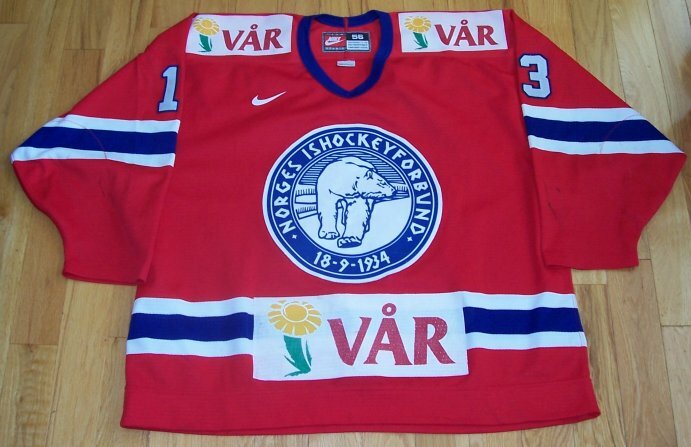 Made by Tackla, This size XL game-worn hockey jersey comes from the Norwegian National Team. 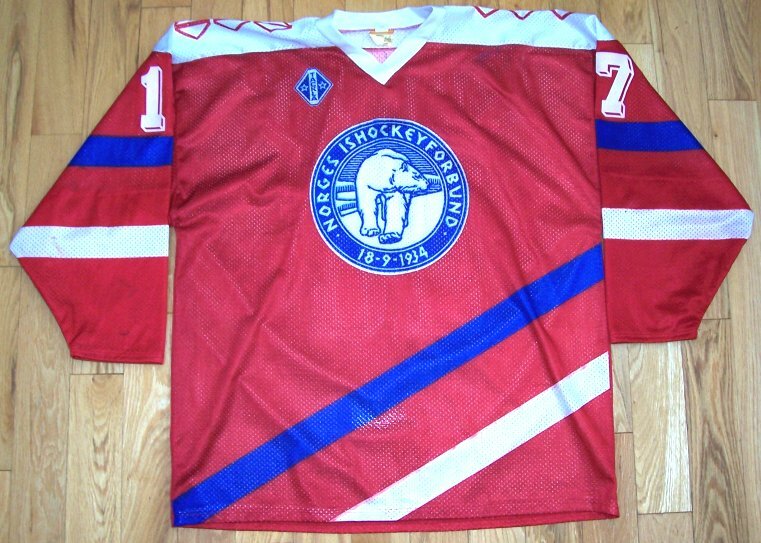 I got this on Ebay from Jon, a Norwegian friend who collects jerseys. 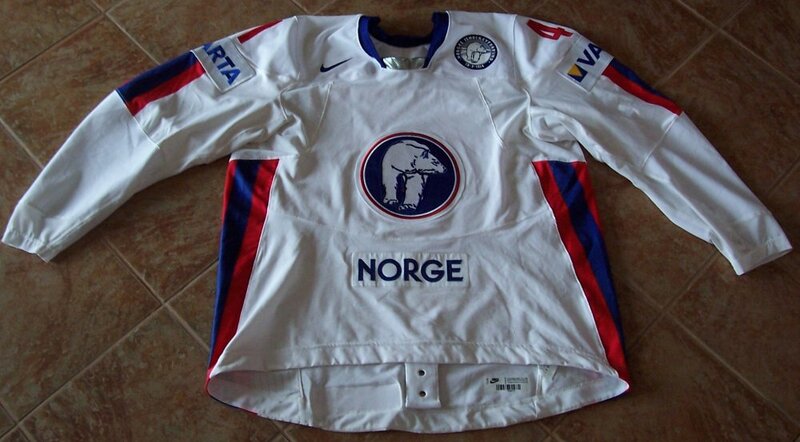 The "Bear" logo is screened on. 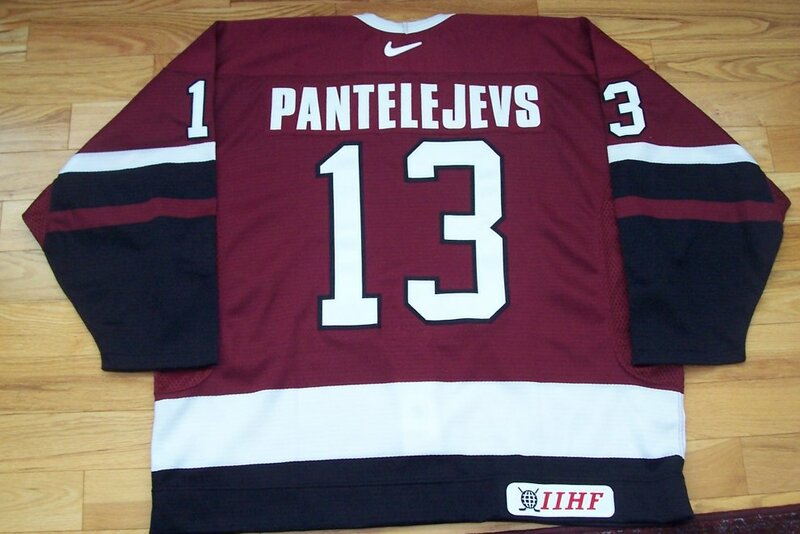 The name is felt on a nameplate, which is sewn on the jersey. 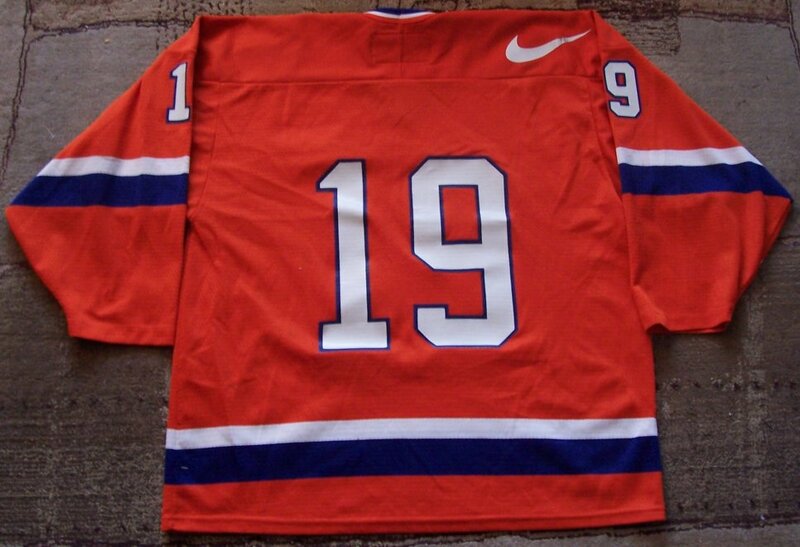 The back numbers are vinyl and the sleeve numbers are felt, which are ironed on the jersey. There are some stick marks and minor pulls. 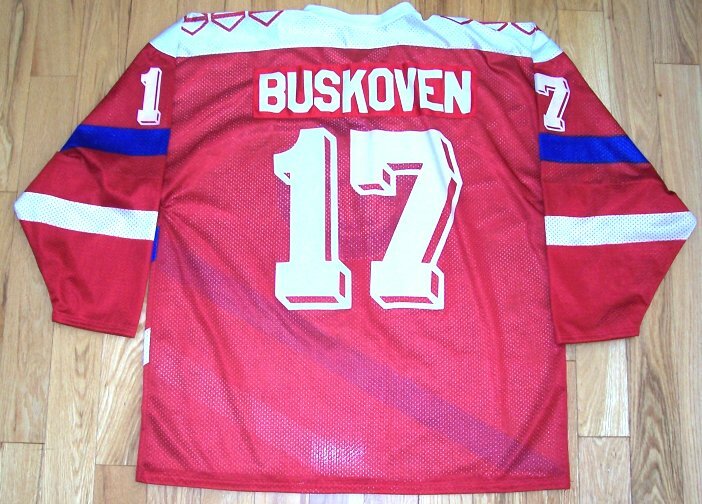 The jersey was worn at the 1990 World Junior Championships. 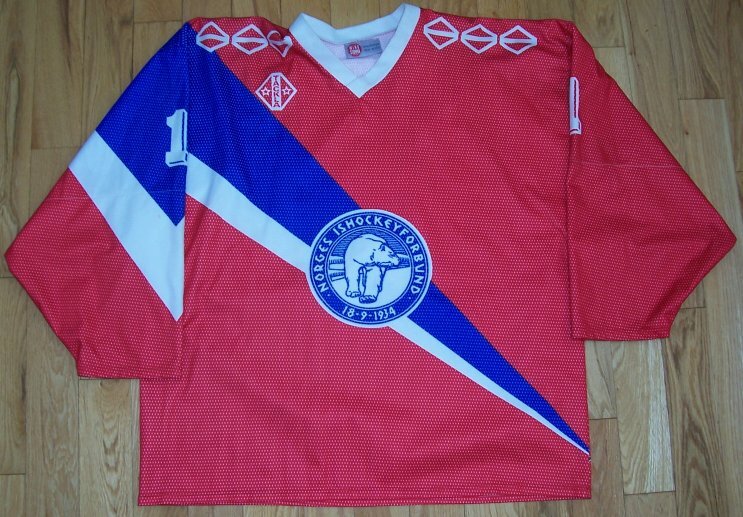 Made by Tackla, This size XXL game-worn hockey jersey comes from the Norwegian National Team. 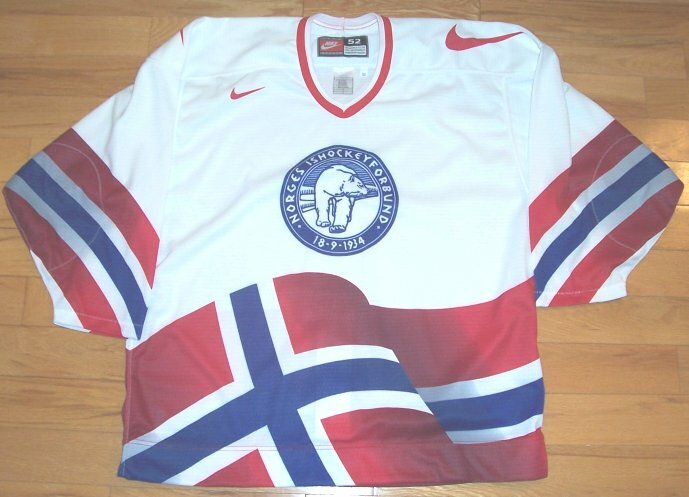 I got this from a Jon, a Norwegian friend who collects jerseys. Everything is screened on. 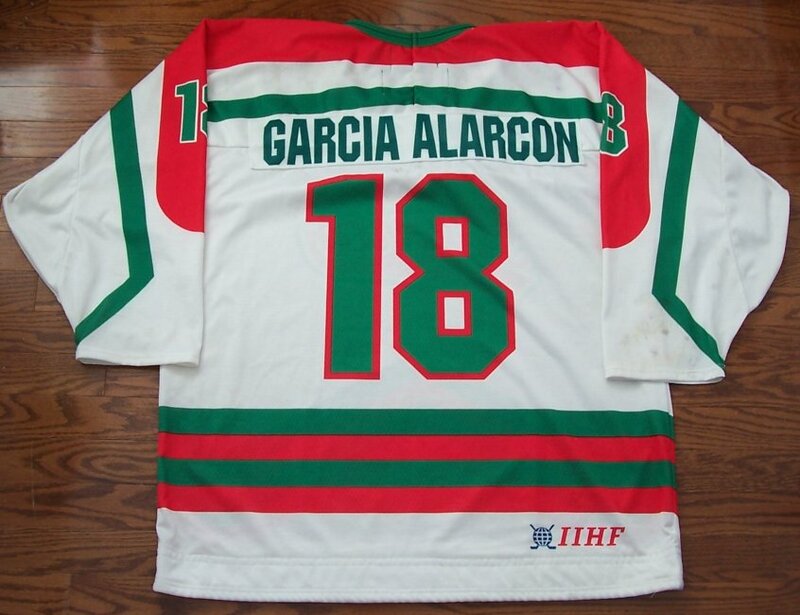 Name screened on nameplate, then plate sewn on jersey. 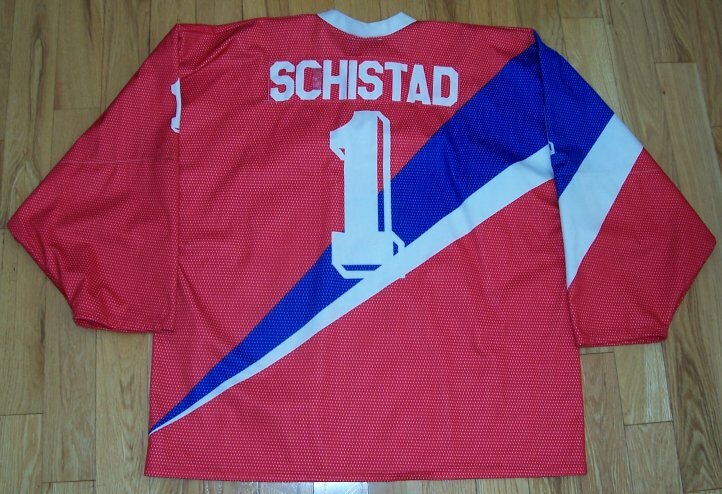 They made a mistake on his name (wrote "SOHISTAD"), so they used a red marker to convert the "O" to a "C"
I included a photo from the 1992 Olympics...everything matches! 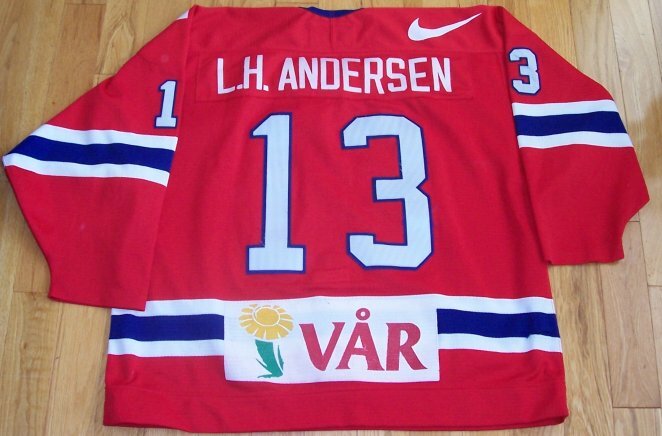 Made by Nike, size 56, This is a game-worn jersey of the Norwegian National Team. Logo, name and numbers are sewn on. 'VAR' ads are screened on. 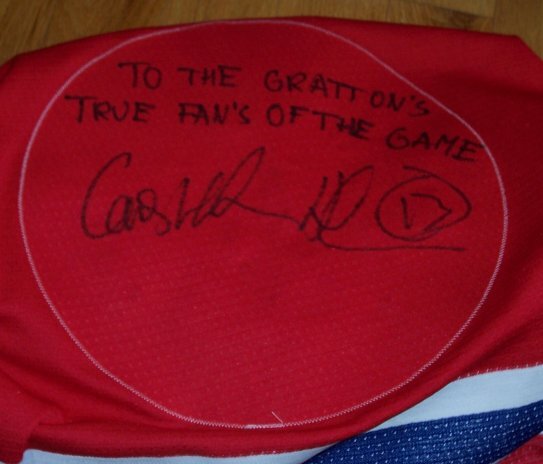 The player signed the jersey inside the logo just for us! 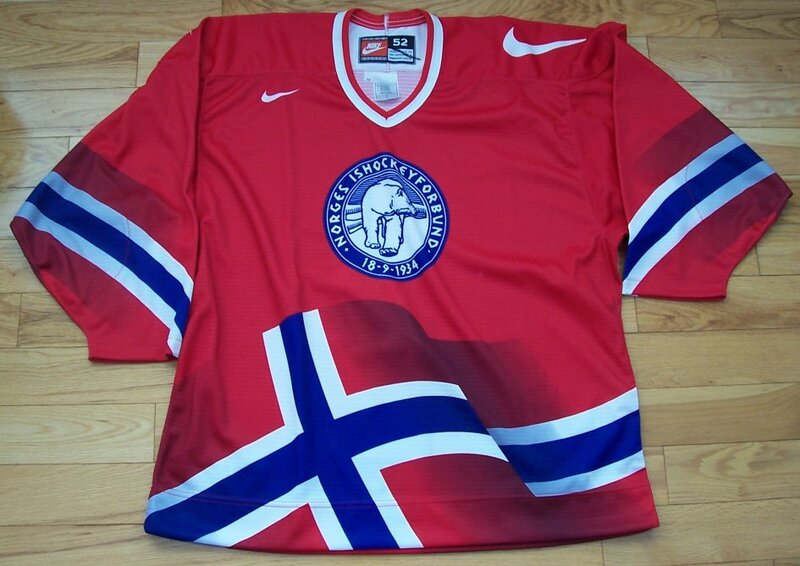 Made by Nike, size 60, This is a game-worn jersey of the Norwegian National Team. I got this from through my friend Jon from Norhawk...MANGE MANGE MANGE TAKK!!! 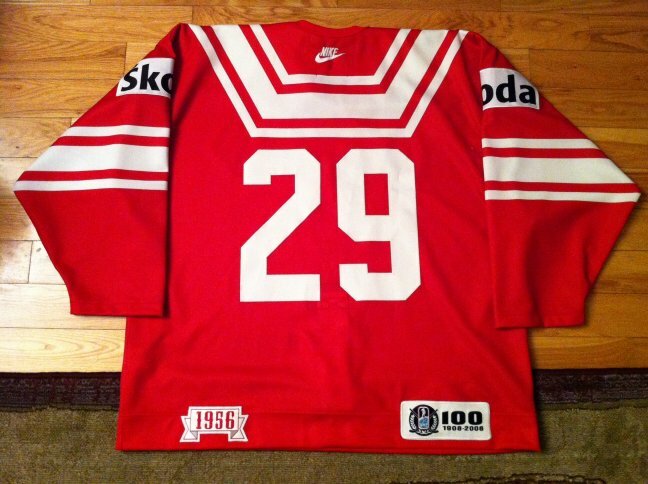 This is one of those Nike 'swift' jerseys...Boy are they different from the 'regular ones'! 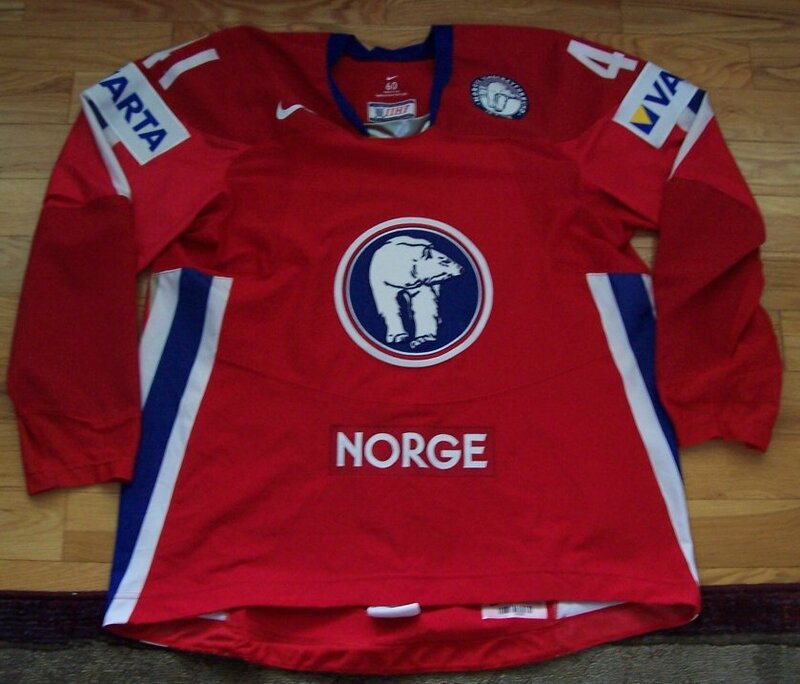 Bear Logo, 'Norge', 'Varta' and 'IIHF' patches as well as the numbers are sewn on. 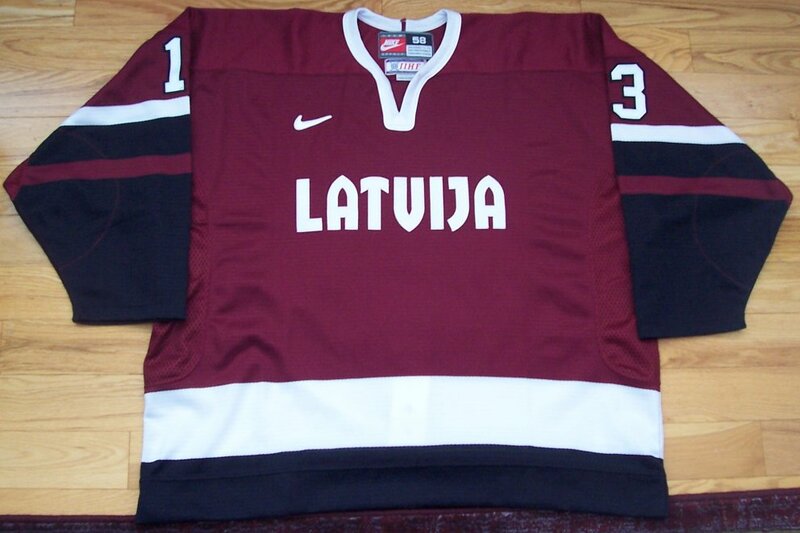 It was worn for 2 games (versus Canada and USA) during the IIHF World championships in Latvia in 2006. It shows wear with a few marks and nicks and I was able to PHOTO-MATCH it! 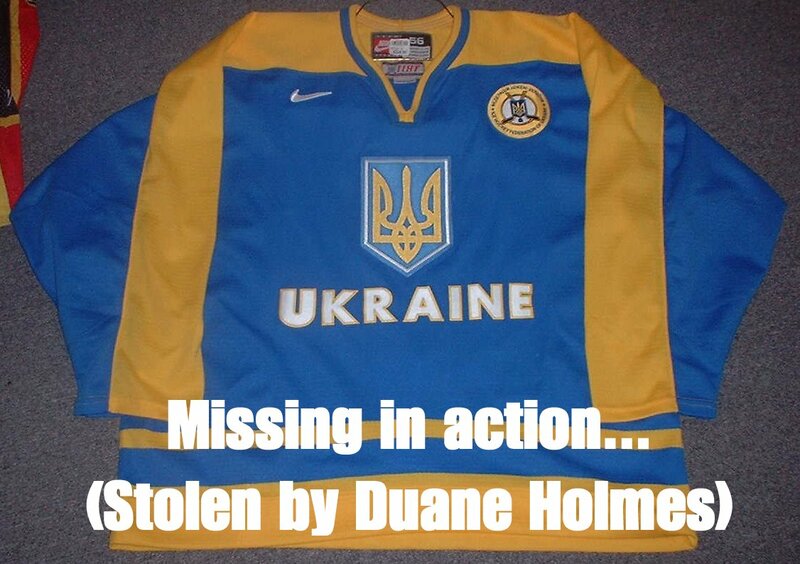 I got this from my friend Pat who got it from Milt Byron of Byron's Hockeyland. 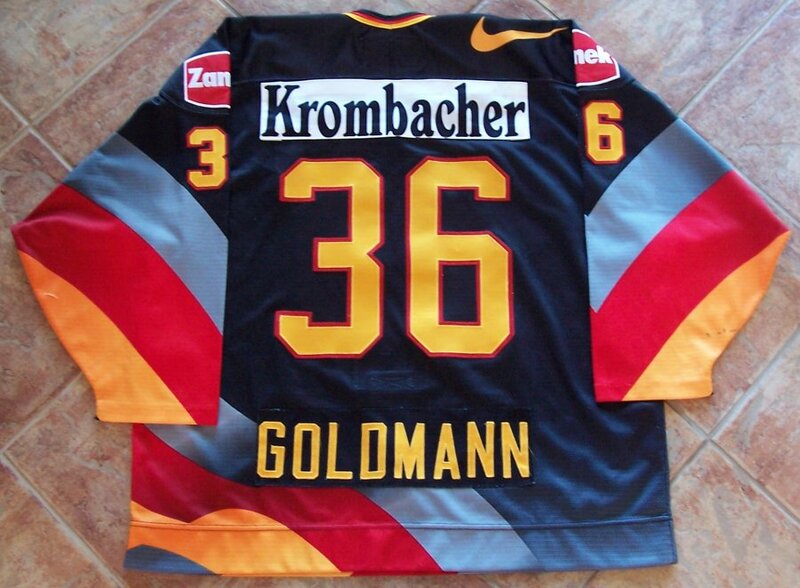 It's funny as I know exactly which collector owned this jersey from the beginning...I am the 5th owner of this shirt! 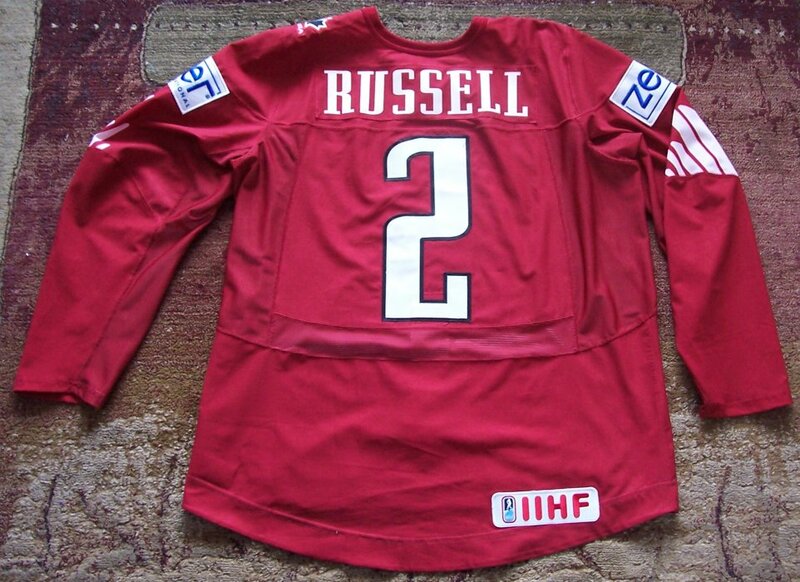 The jersey was worn for 4 games during the IIHF World championships in Latvia in 2006. It shows wear with a few marks and nicks. 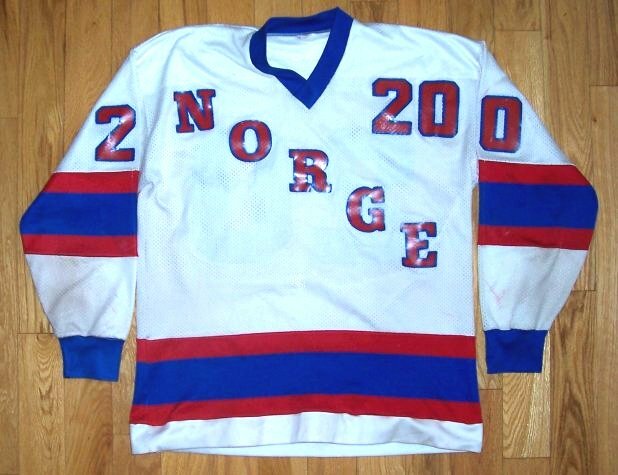 This is an OLD game-worn jersey of the Norwegian National Team. The federation patch was removed on the front. 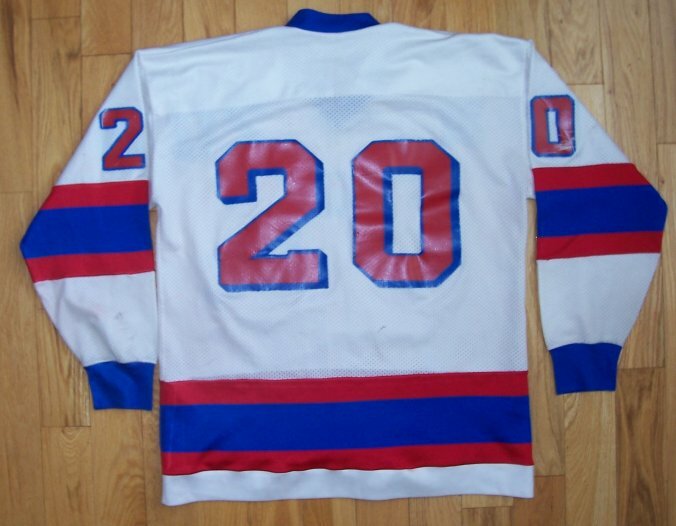 A truly RARE and OLD GW jersey!!! 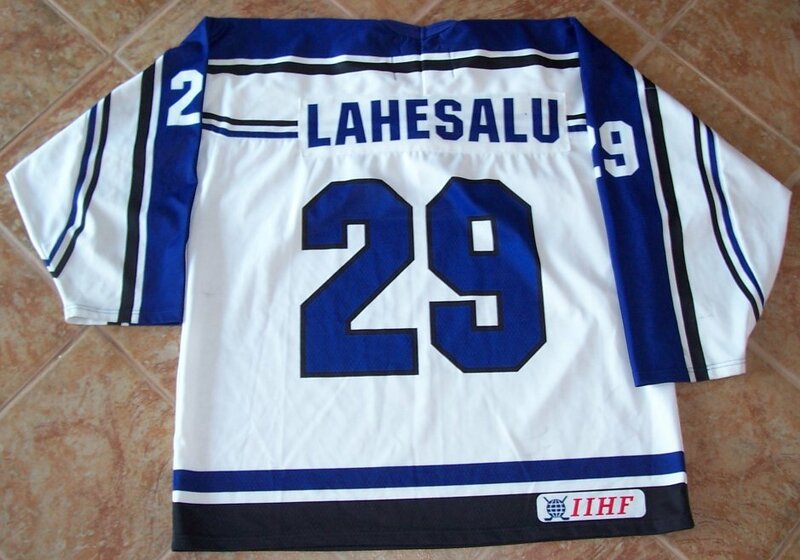 Made by Tackla, size XL, this is a game-worn jersey of the Estonian National Team. I got this through my friend Nick in a trade...Thanks Nick!!! 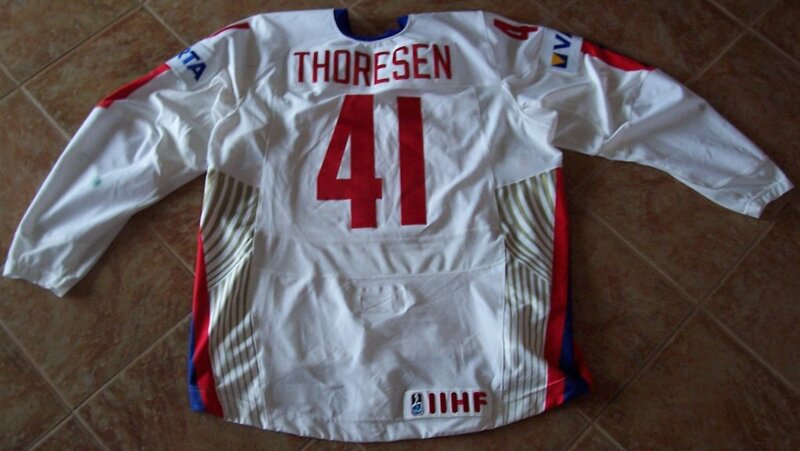 This jersey was worn during the 2006 Div 1B world championships in Talinn Estonia. It shows great wear for a 5-game tournament! 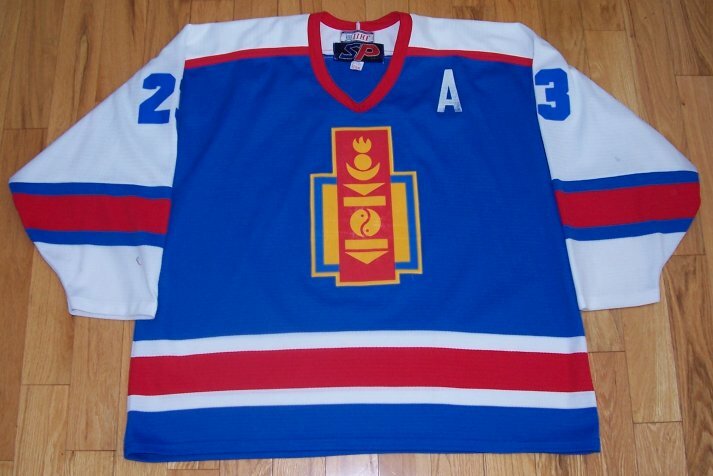 Made by SP, size XL, this is a game-worn jersey of the Mongolian National Team. I got this with a lot of work and help! 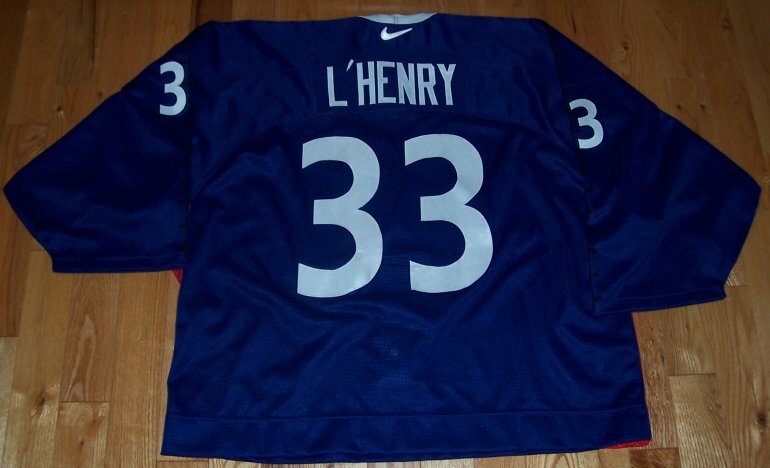 Jersey shows a nameplate change. 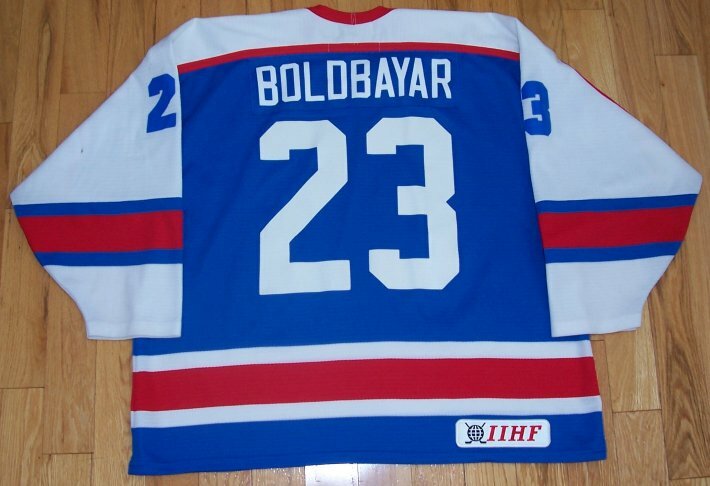 Boldbayar played in the IIHF Oceanic Under 18 tourneys in 2000, 2001 and 2002, but was wearing #22. 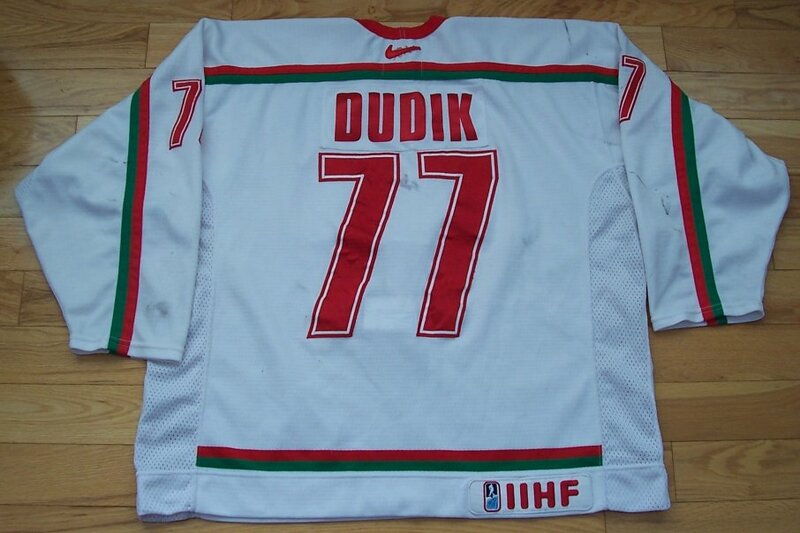 This is probably the 'Holy Grail' of my IIHF collection...one of my favorites! 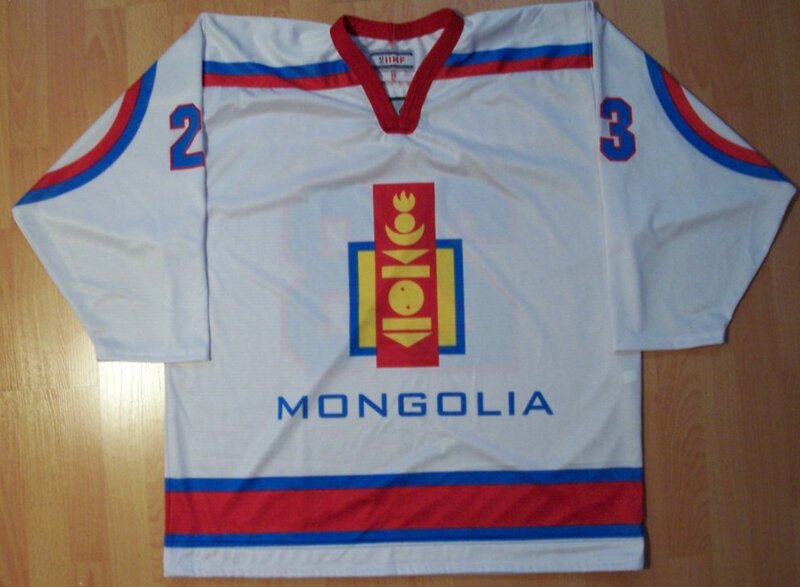 Made by Tackla, size XL, This is a team-issued jersey of the Mongolian National Team!!! 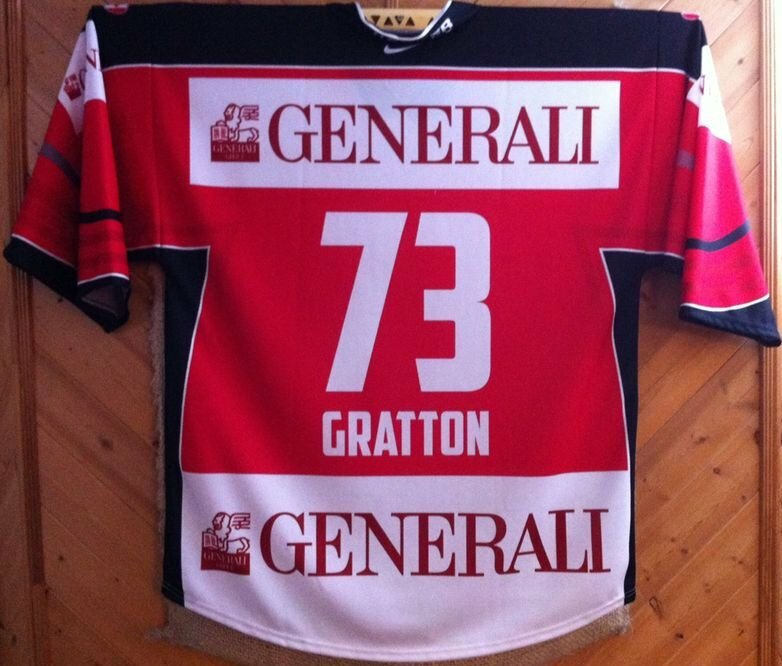 Logos and numbers are subliminated on the jersey. 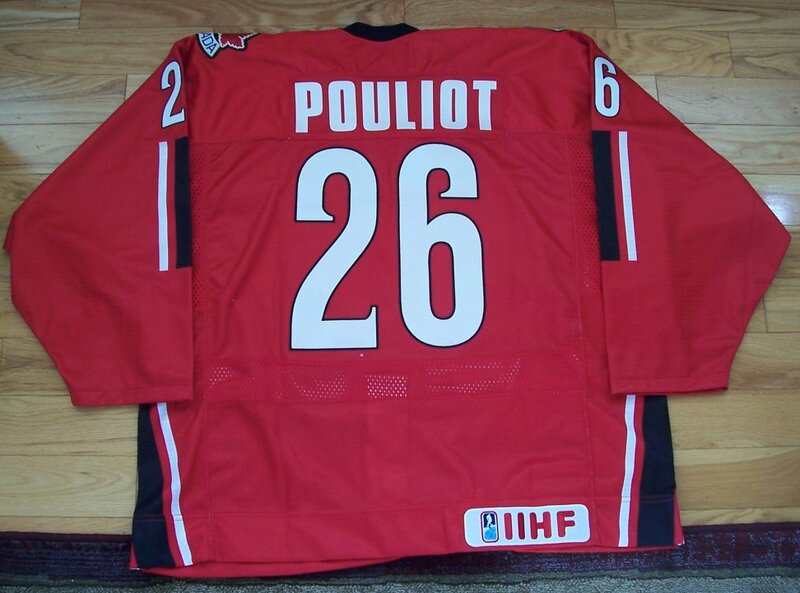 Subliminated nameplate is sewn on the jersey. 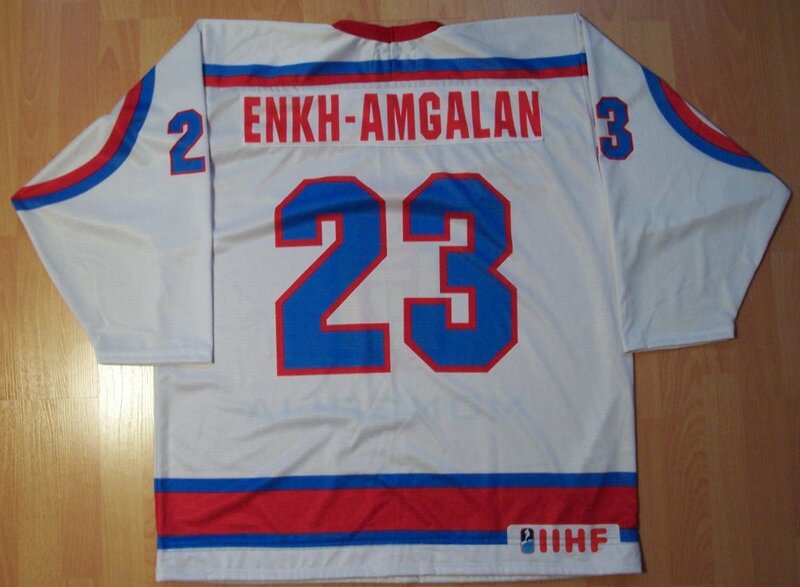 The preliminary Mongolian roster included Enkh-Amgalan, but he didn't dress or play. tournaments and they try their best. Thanks Christophe for this gem! I was a tough trade to do, but I am very happy with the new additions! 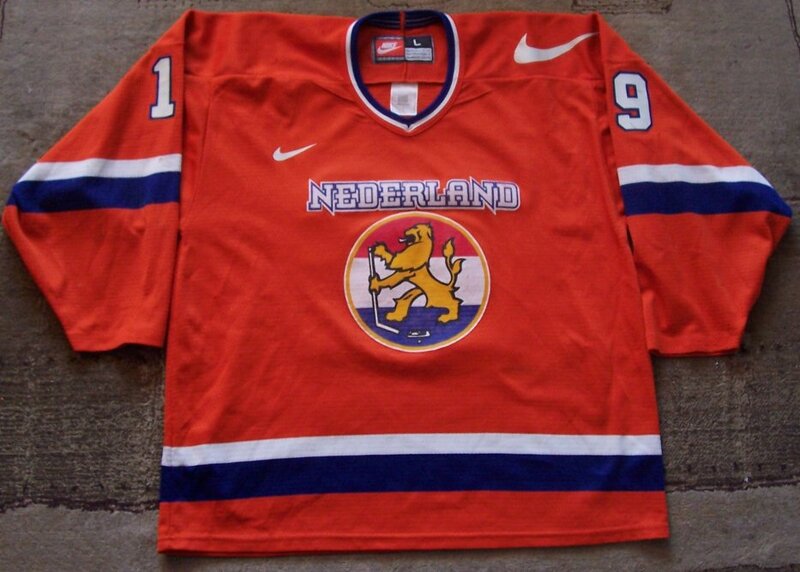 Made by Nike, This size L game-worn hockey jersey comes from the Dutch National Team. 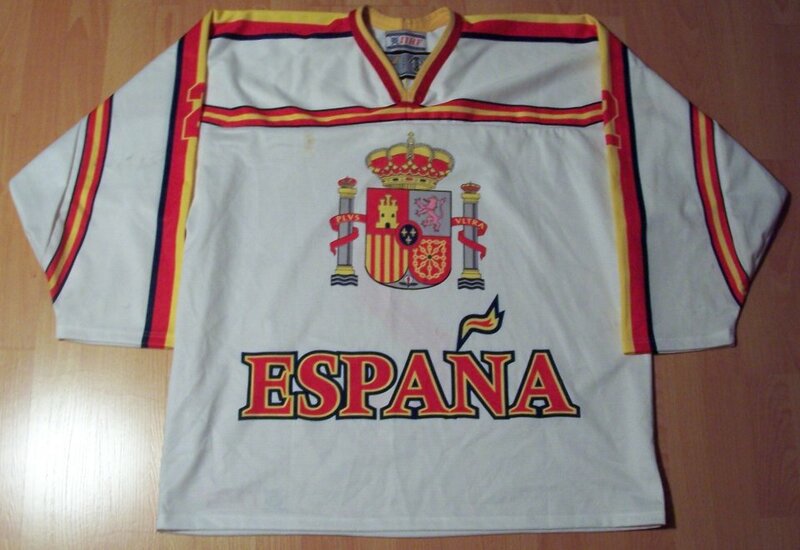 Made by Tackla, size XL, this is a game-worn jersey of the Spanish National Team. I got this through my friend Nick...Thanks Nick!!! 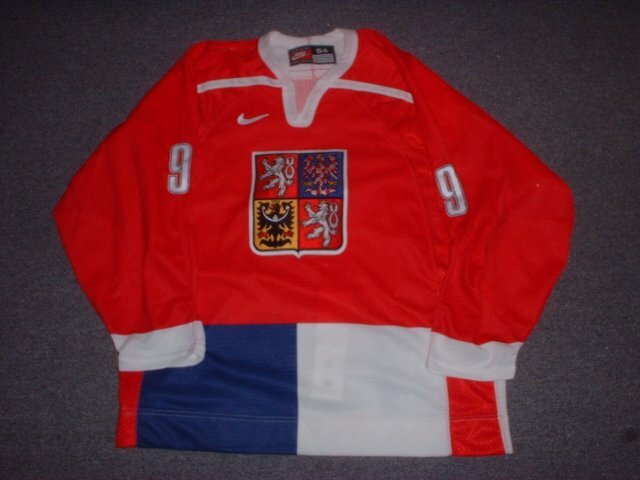 This jersey was worn during world championship tournament. 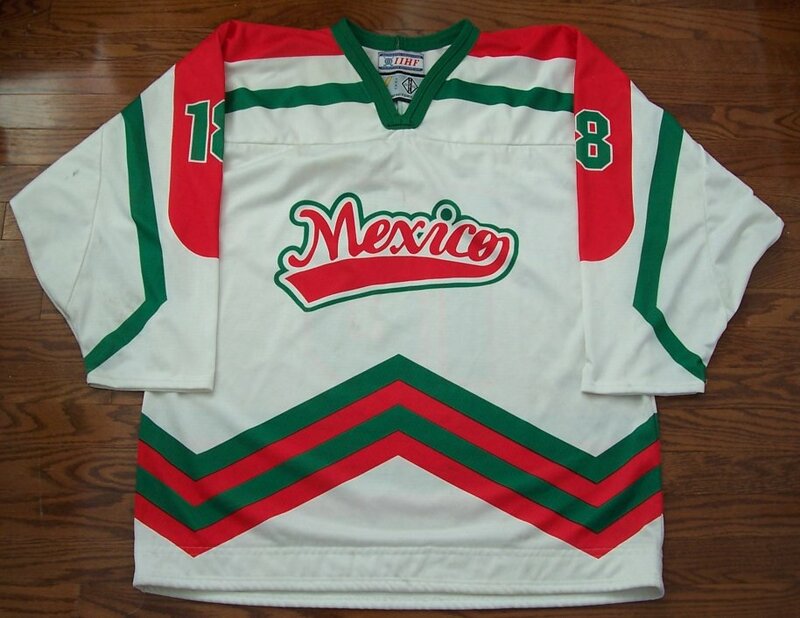 It shows great wear for a 5-game tournament including stick marks and blood stains! 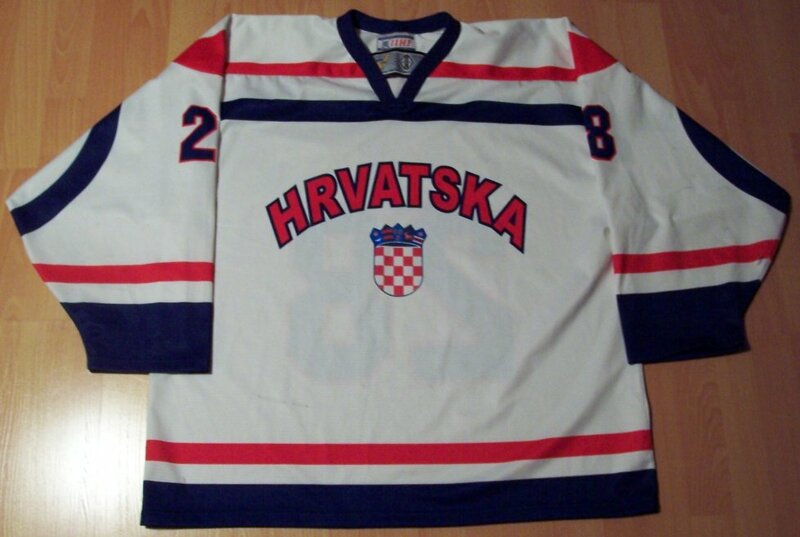 Made by Tackla, size XXL, this is a game-worn jersey of the Croatian National Team. 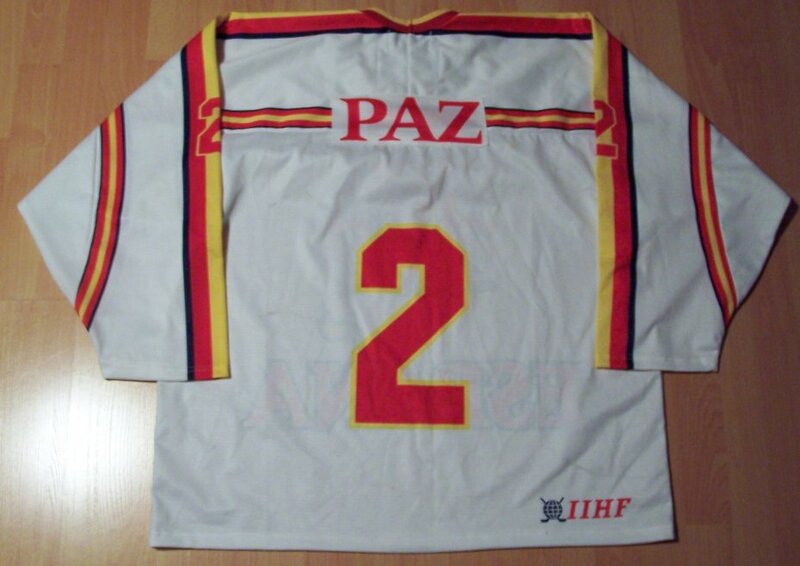 This jersey was worn during multiple tournaments or friendlies as it shows of at least 2 different nameplates. 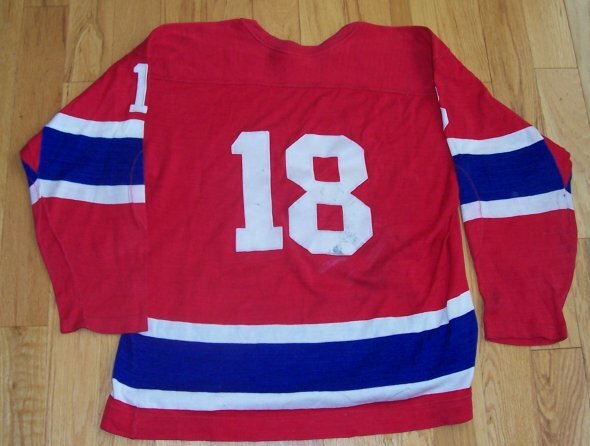 It shows some wear including stick marks and a small unreparied hole on the back! 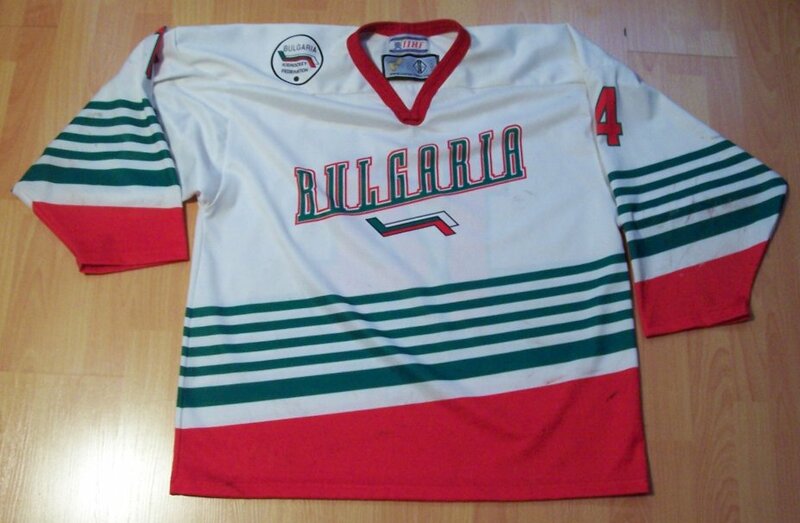 Made by Tackla, size L, this is a game-worn jersey of the Bulgarian National Team. I got this through my friend Christophe...Merci!!! It shows great wear including holes, stick marks and blood stains! 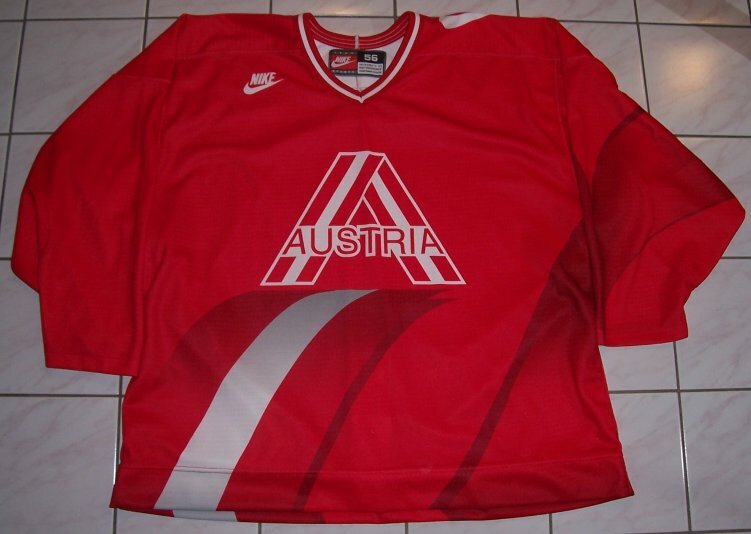 Made by Nike, This size 56 game-worn hockey jersey comes from the Austrian National Team. All logos, patches and numbers are sewn on. 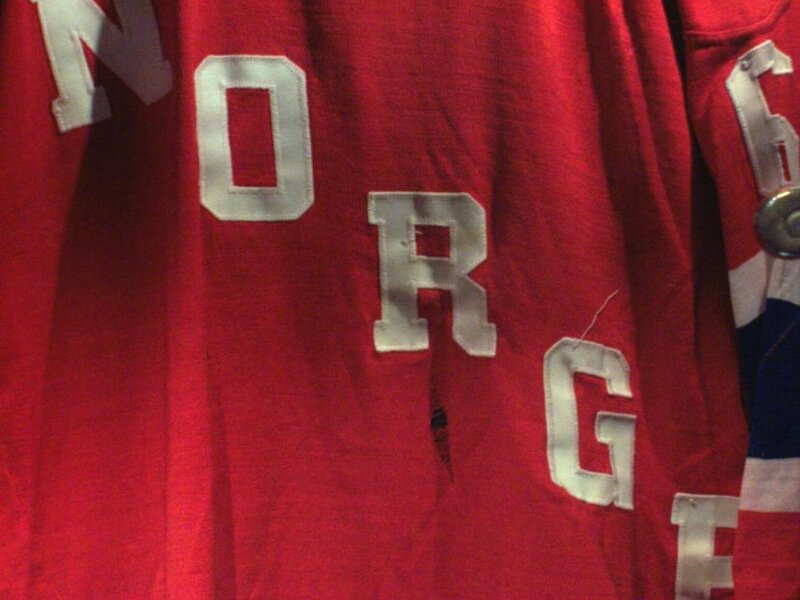 The letters on the nameplate are glued on the nameplate, which is sewn on. There are nice marks on it all over. 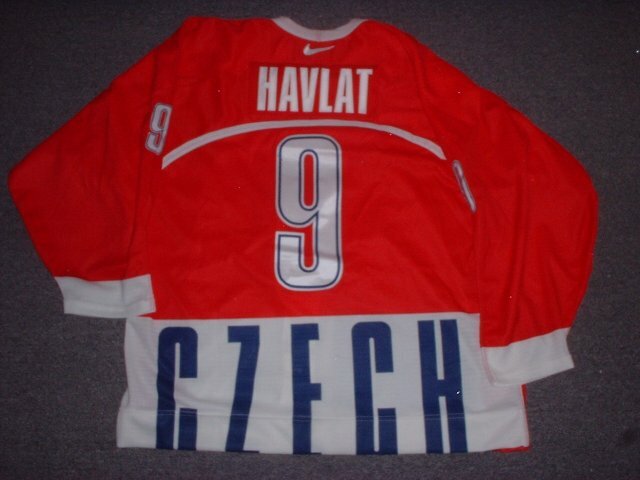 This jersey was worn during the 2004 World championships in the Czech Republic. 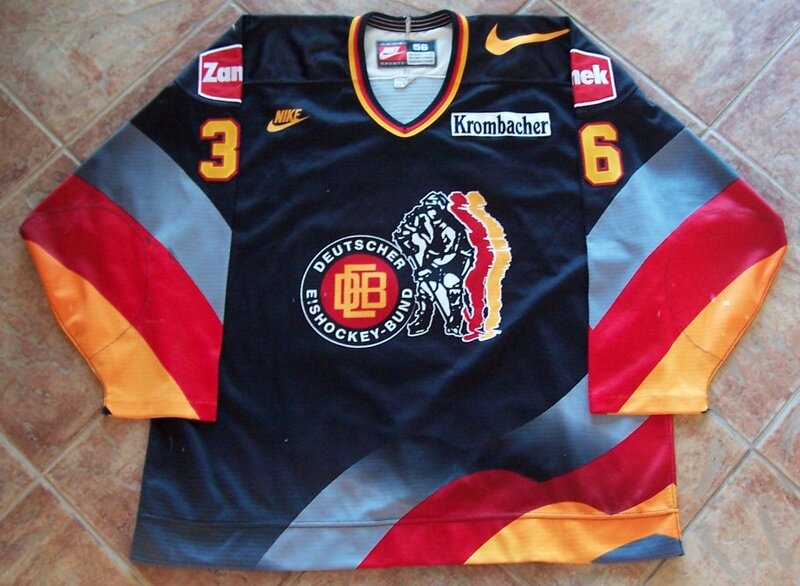 I got this through a trade....Danke / Grazie Patrick!!! 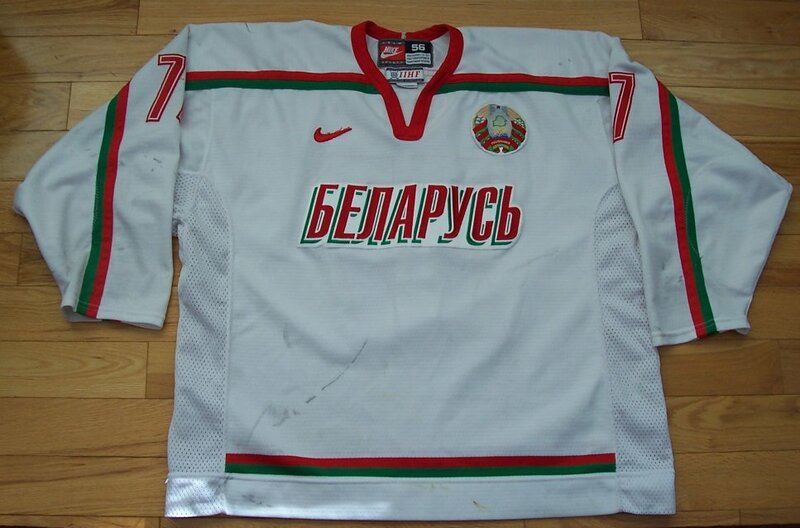 Made by Nike, This size 58 game-worn hockey jersey comes from the Belarus National Team. 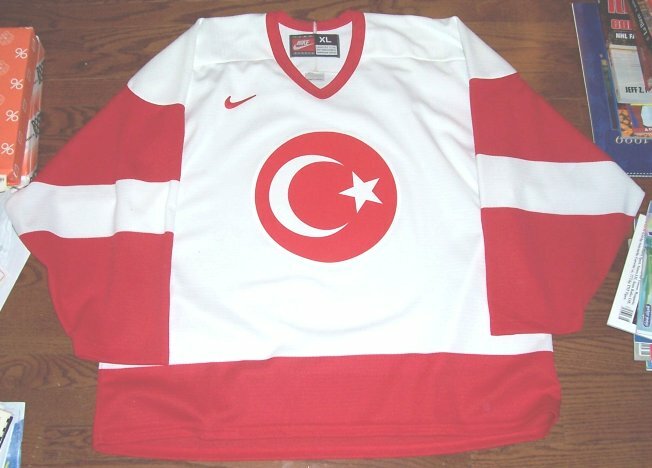 This jersey was mostlikely worn during the 2002 Olympics in Salt Lake City! 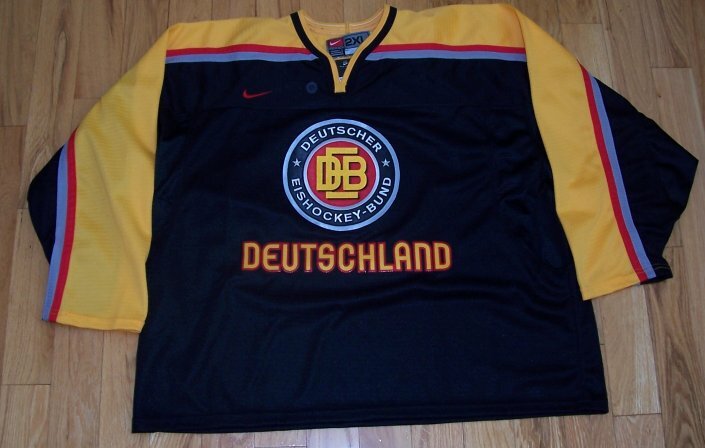 I got this jerseys on the web, thanks Mike and Nick! 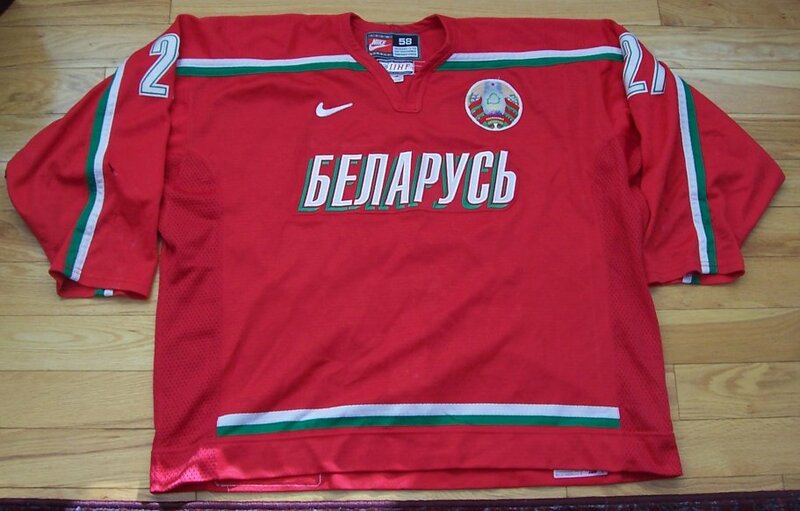 Made by Nike, This size 56 game-worn hockey jersey comes from the Belarus National Team. 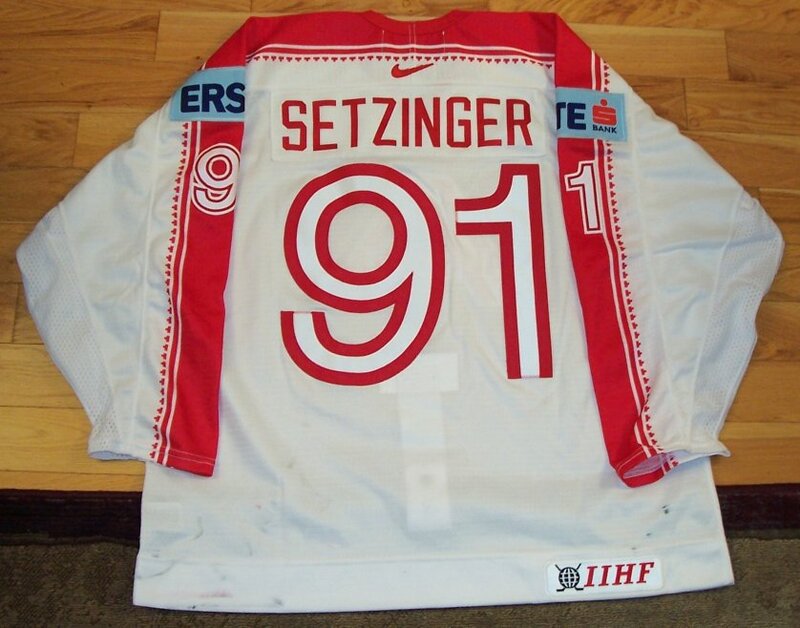 The 'Zepter'advertisement patches on the sleeves were removed by the team, thus meaning the jersey might have been re-used in other games. There are nice marks on it all over including a few unrepaired holes. 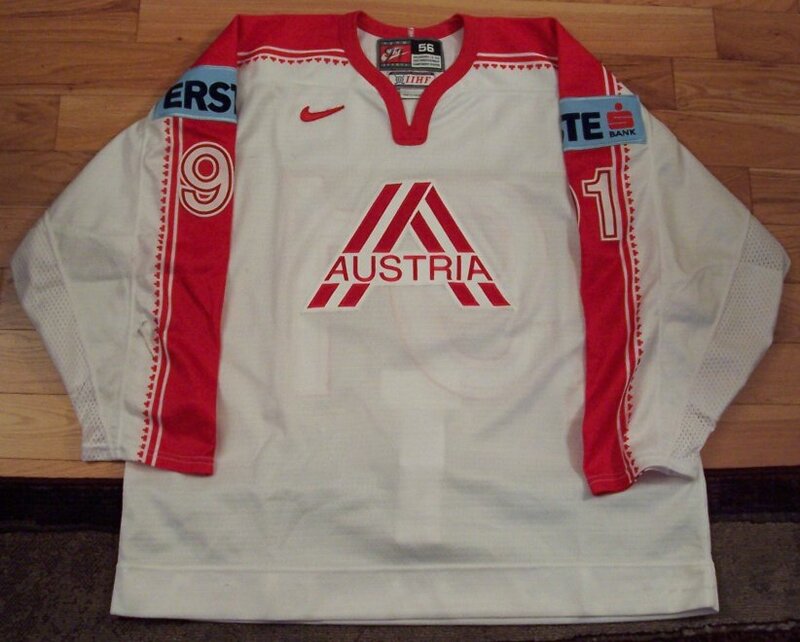 This jersey was worn during the 2005 World Championships in Austria. 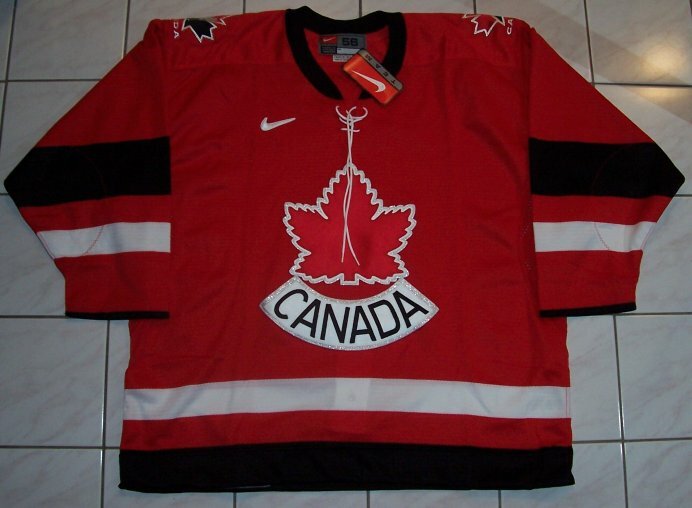 Made by Nike, This size 58 game-issued hockey jersey comes from the Canadian National Team. The numbers are sewn on. The letters on the nameplate are glued on. 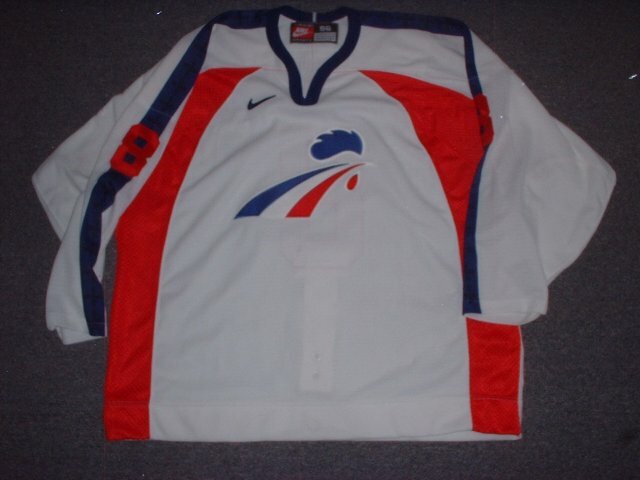 This jersey is a "mock-Swift" type jersey. They were created to look like swift-type shirts, but are airknit. 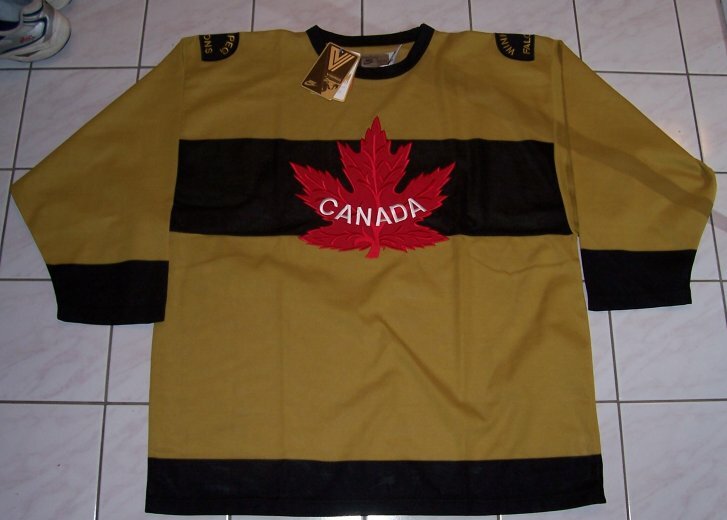 Eventually, Team Canada decided to keep the new Swift jerseys, thus these were never used. 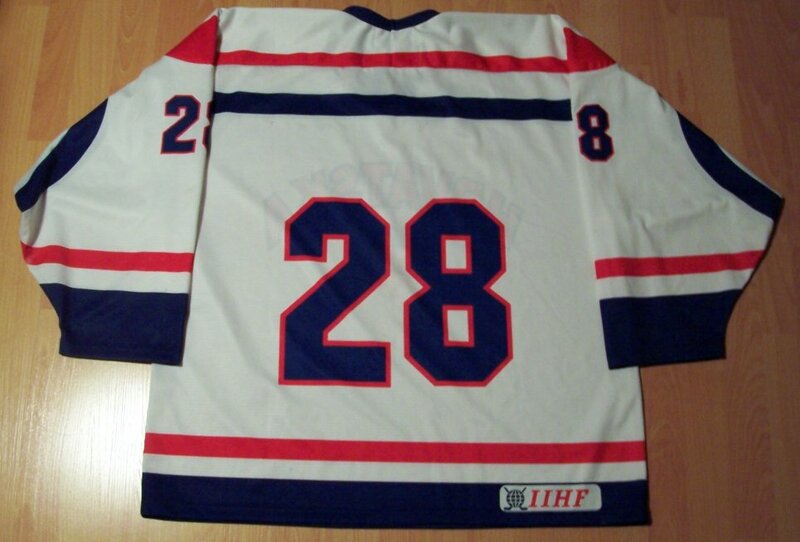 Even though Benoit wore #37 during the World Juniors, he was wearing #26 during the pre-camp, thus the reason this set has him with #26. 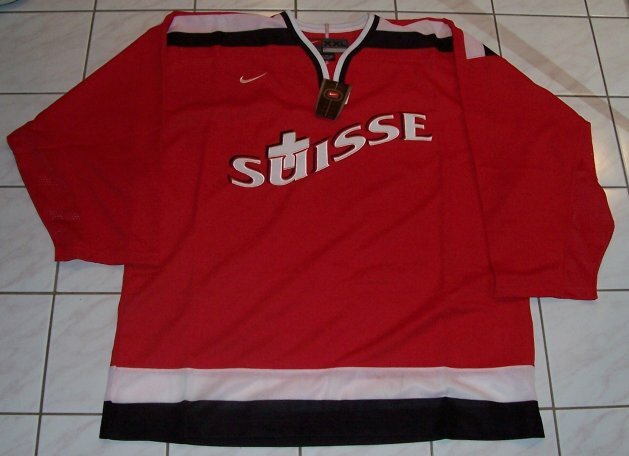 Other countries like Finland, Sweden and Switzerland used these style during the 2006 Olympics in Torino. 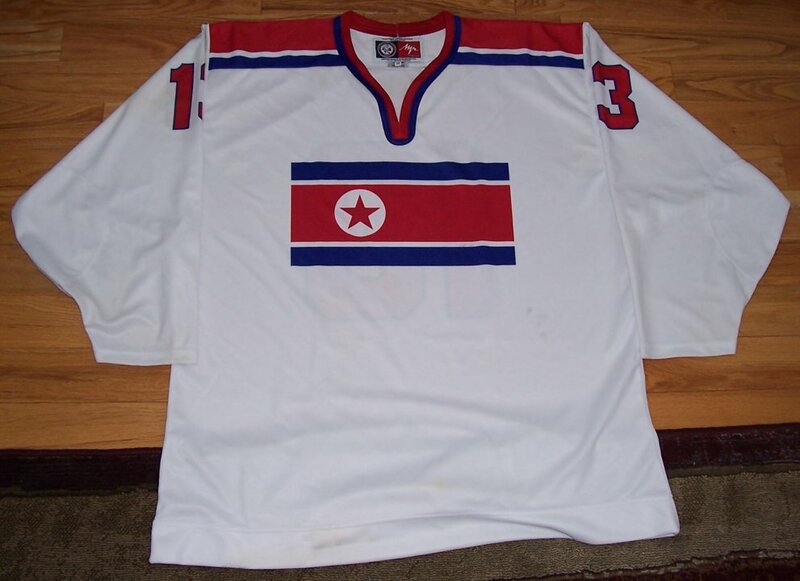 I got this jersey trough a trade with my friend Pat. Thanks Pat!!!! 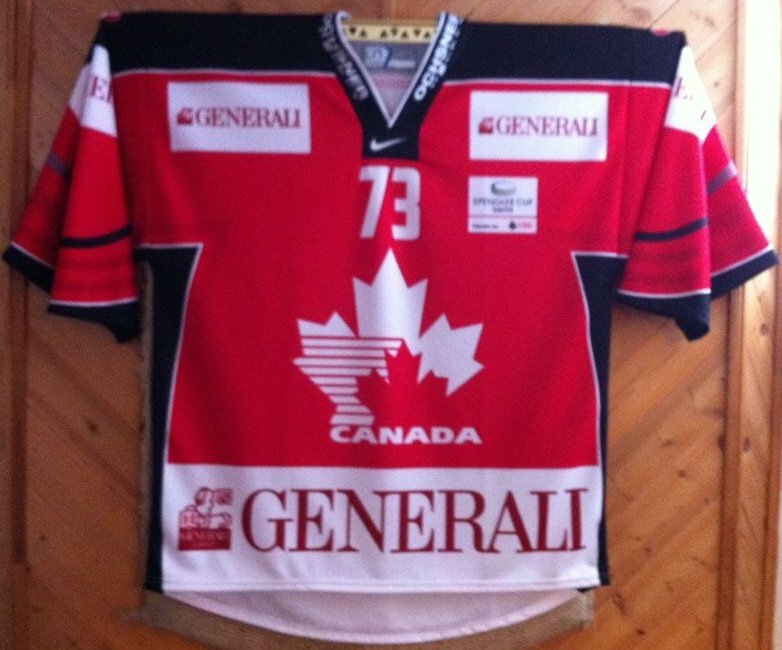 Made by Metzen, This size 54 hockey jersey comes from the Heartbreakers hockey team. The Metzen logo on back is sewn on. 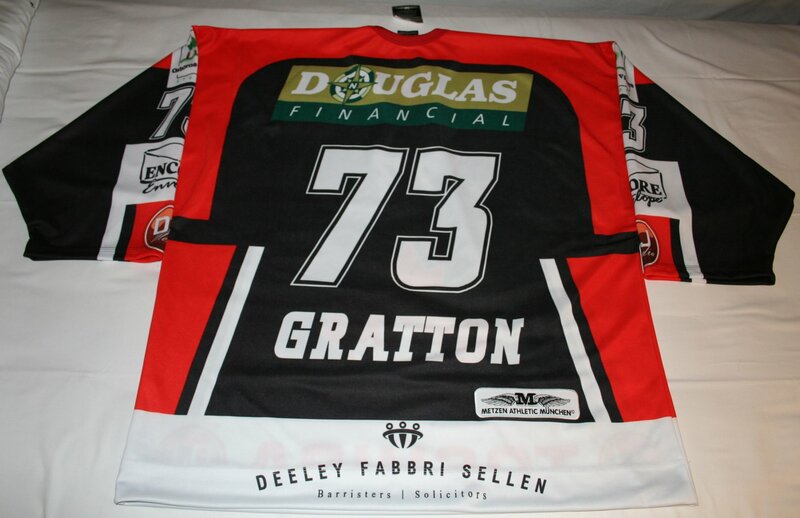 The numbers, letters, logos and sponsors are all sublimated. I got this jersey as I played for the 2011 edition of the Heartbreakers tour!!! We played 5 games in Meisbach and Bad Aibling Germany as well as Zell Am See and Telfs Austria. We finished with a record of 1-4, but had tons of fun! 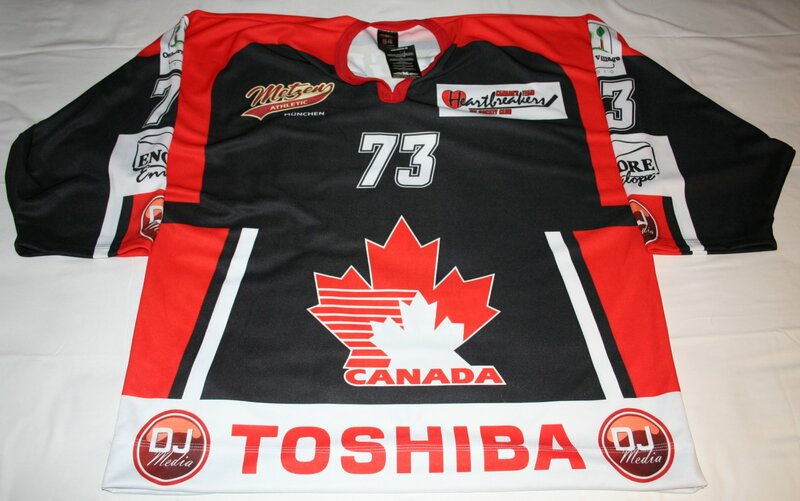 Made by Ochsner, This size XXL hockey jersey comes from the Heartbreakers hockey team. I got this jersey as I played for the 2013 edition of the Heartbreakers tour!!! 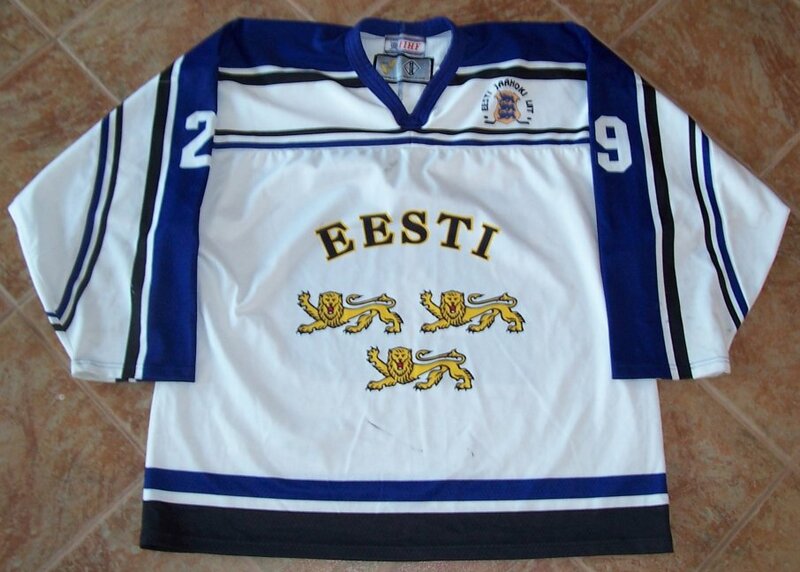 We played 5 games in Helsinki and Tampere Finland, St. Petersburg Russia as well as Alta Sweden. We finished with a record of 1-3-1, but had tons of fun! 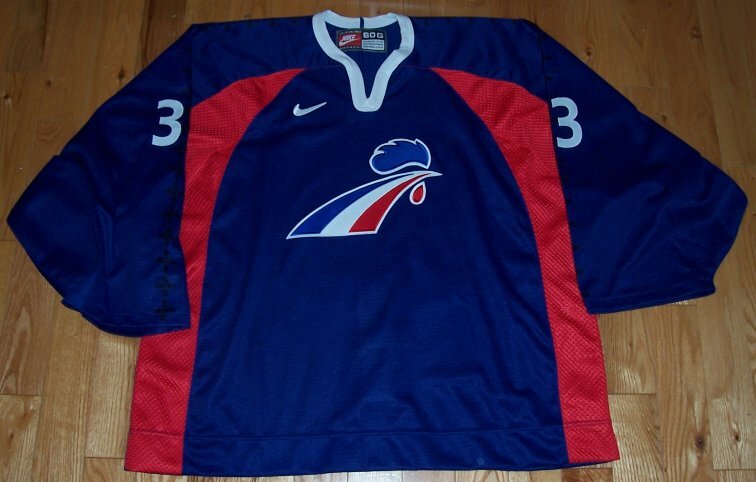 Made by Nike, This size 58 game-worn hockey jersey comes from the Russian National Team. front logo, patches (on hem and sponsors) and numbers are sewn on. There are nice marks on it for a one-game-wonder. 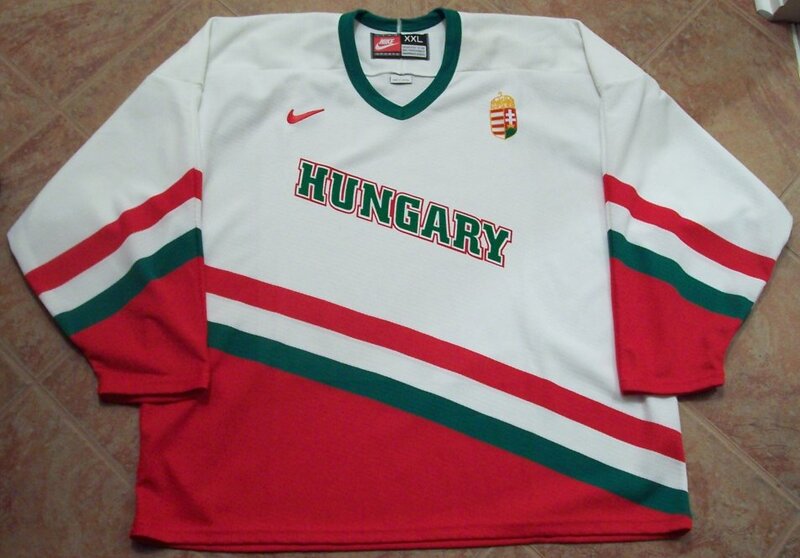 This special retro jersey was specially made to celebrate the 100th anniversary of the IIHF. 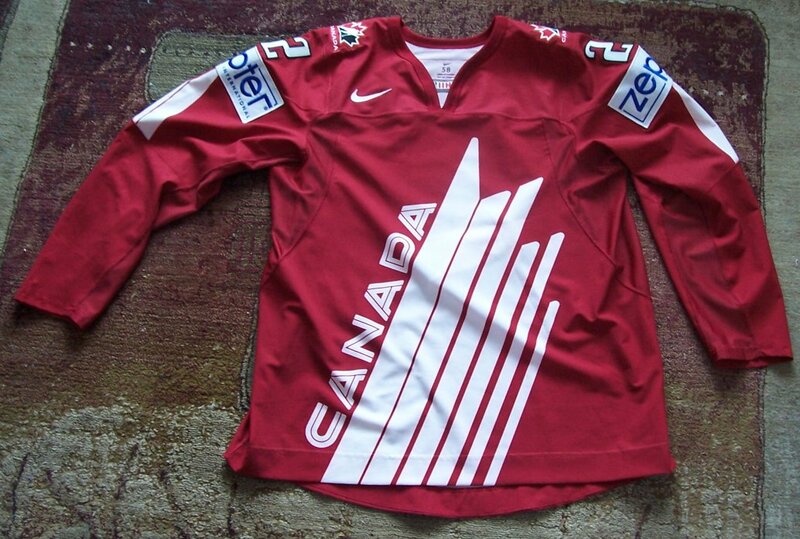 This jersey was worn during the 2008 World championships in Quebec City, Canada. It was used against the Italy, a game which Russia dominated. 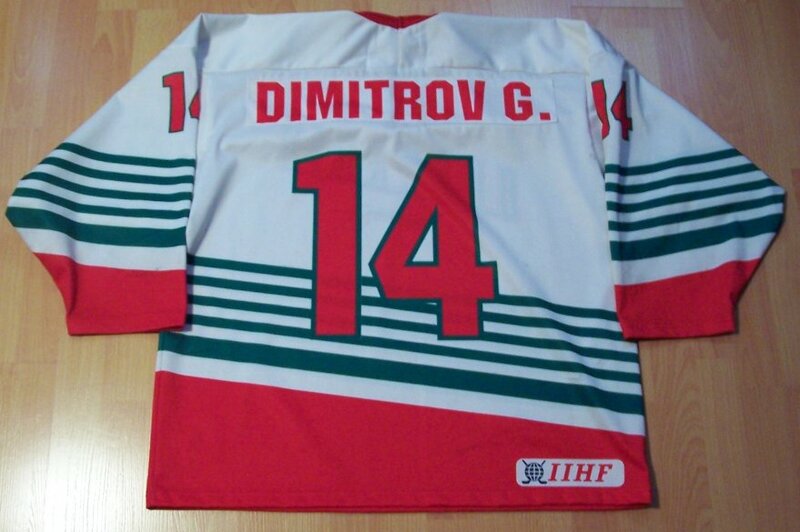 Russia won the tournament (GOLD MEDAL) and Fedorov was one of the assistant-captains. 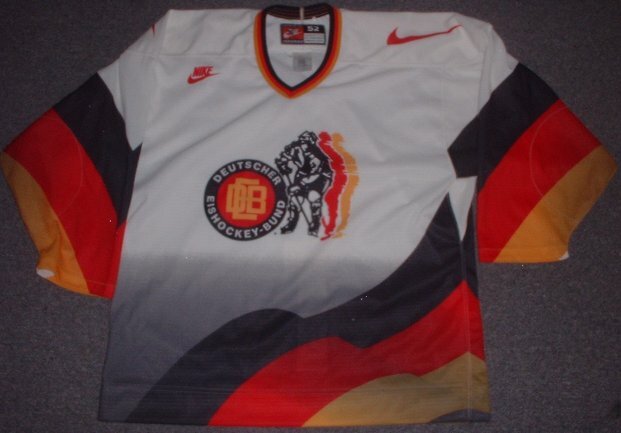 This jersey is EXTREMELY RARE. 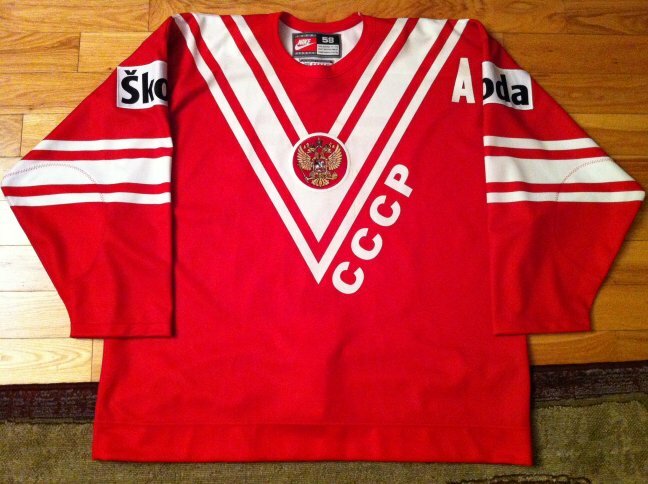 This is the first Retro Russia jersey I've seen other than during the game itself. 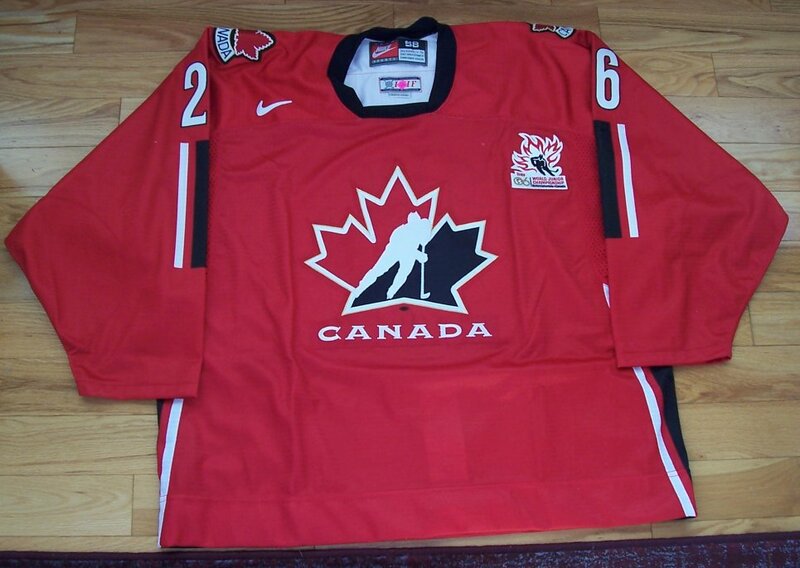 Made by Nike, This "Swift Style" size 58 game-worn hockey jersey comes from the Canadian National Team. front logo, arm striping is sublimated. 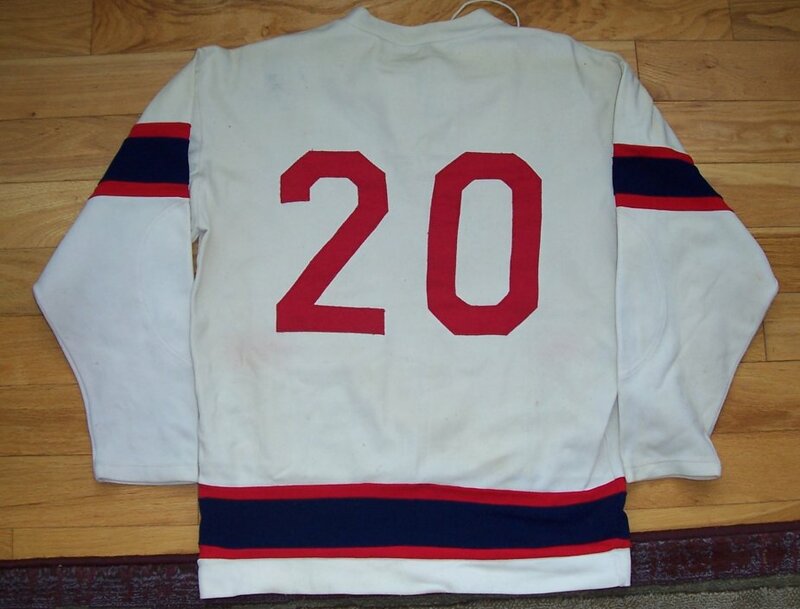 Name on back is "ironed on" a nameplate which is sewn on the jersey. patches (on hem and sponsors) and numbers are sewn on. There are a few very light marks on it.